1) هویج نیزازجمله میوه هاي خنک است. آهن ،پتاسیم، سدیم، فسفر، مس ، منیزیم، منگنز، کلسیم، گوگرد. 4) از مهمترین آثار هویج می توان به تقویت بینایی اشاره کرد. 5) هویچ در پیشگیري از پوسیدگی و کرم خوردگی دندان ها نیز تاثیر قابل توجهی دارد. هاي قلبی پیشگیري می نماید. 7) هویج اشتها را نیز تحریک کرده وانرژي از دست رفته بدن را تامین می نماید؛ در سوخت وساز بدن نیز سهم بسزایی دارد. 8) هویج کبد را شستشو داده و بیماري هاي پوستی ناشی از اختلال هاي کبدي را درمان می نماید. تب را کاهش می دهد. 9) هویج از ابتلا به دیابت جلوگیري می کند. 10) هویج از ابتلا به بیماري هاي کبدي ، صفرایی و سنگ کلیه جلوگیري می نماید و در درمان قونج و آپاندیس بسیار مفید است. 12) در نهایت نیز هویج پوست را نرم وشاداب کرده و از پیري و چین و چروك پوست پیشگیري می کند. براي تنگی نفس مفید و درد سینه وگلو را تسکین می دهد. لوزالمعده راتقویت، دردهاي معده را تسکین و سوء هاضمه را درمان می نماید. هویج سینه را نرم ، پوست را ترمیم و بیماري هایی نظیر آسم ، بواسیر، زردي، سل ،یبوست و یرقان را بهبود می بخشد. 13) آب هویج براي قلب مفید است و اعصاب را آرام می نماید. Botanically they are the taproots belong to the Apiaceae or umbelliferous family in the genus; Daucus. Scientific name: Daucus carota. The other close Apiaceae members include parsnips, parsley, dill, cumin, etc. cylindrical shape. Note for different color carrots! Daucus carota species cultivated across the world for their prized taproots. This biennial plant bears flowers during the second season. However, in general, the whole plant is harvested much prematurely without a wait for the bloom when its root reaches about an inch in diameter, tender and juicy. Carrots vary widely in color and shape depending upon the cultivar types. Oriental taproots are long, featuring a flat top end with tapering, tail-like lower parts. They are winter season crops in many areas of Asia. European carrots, on the other hand, are cylindrical with rounded ends. Also, European varieties feature bright orange color in contrast to saffron colored Asian cultivars. They are an exceptionally rich source of carotenes and vitamin-A. 100 g fresh carrot contains 8,285 µg of beta-carotene and 16,706 IU of vitamin-A. Studies have found that flavonoid compounds in carrots may offer to protect from skin, lung and oral cavity cancers. In the humans, carotenes convert into vitamin-A in the liver cells. Beta-carotene is the important carotene type present in these roots. Beta-carotene is one of the powerful natural antioxidants that protect the human body from harmful oxygen- derived free radicals. Also, it also carries out all the functions of vitamin-A such as maintaining good eye health, reproduction (sperm production), maintenance of epithelial integrity, growth and development. 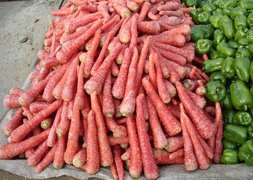 Carrots are rich in polyacetylene antioxidant, falcarinol. A research study conducted by scientists at the University of Newcastle on laboratory animals has found that falcarinol in carrots may help fight against cancers by destroying pre-cancerous cells in the tumors. Fresh roots are also good in vitamin-C; provide about 9% of RDA. Vitamin-C is water soluble antioxidant. It helps the body maintain healthy connective tissue, teeth, and gum. Its anti-oxidant property helps the human body protect from diseases and cancers by scavenging action on harmful free radicals. Also, they are exceptionally rich in many B-complex groups of vitamins such as folic acid, vitamin B-6 (pyridoxine), thiamin, pantothenic acid, etc., that acts as co-factors to enzymes during substrate metabolism in the body. Further, They also compose healthy levels of minerals like copper, calcium, potassium, manganese and phosphorus. Potassium is an important component of cell and body fluids that helps controlling heart rate and blood pressure by countering effects of sodium. The human body utilizes manganese as a co-factor for the antioxidant enzyme, superoxide dismutase. Fresh carrots and green bell peppers in a market. Fresh carrots can be available in the markets around the season. While buying, look for young, tender, bright-colored roots with a firm consistency. Avoid soft, flabby roots, with cuts or mold. Furthermore, avoid very large-sized roots as they can be an indication of overmaturity, resulting in poor eating quality. Undue exposure to sunlight would also lead to greenish discoloration near its top end because of chlorophyll photo-pigmentation. Although this may not affect health badly, however, it can diminish its sweet taste. Avoid twisted or forked carrots as they may be the indication of either root disease. Once at home, wash them thoroughly in cold water to remove dirt, soil, or insecticide/fungicides. The top greens severed from the root before storing. They keep well in the vegetable compartment of the refrigerator for 1-2 weeks. Set refrigerator temperature level below 35 degrees F and high humidity to maintain freshness. Wash carrots thoroughly before use. Trim both ends; gently scrape off the outer skin and smaller hairy roots. The younger roots have crispy, pleasant taste with rich flavor. Raw carrots are naturally sweet and juicy; however, boiling them in water for few minutes enhances the bioavailability of nutrients. Fresh carrots can be enjoyed as they are, or can be used raw in vegetable as well as fruit salads. Its slices easily blend with other common root vegetables like radish, beets, kohlrabi, turnips or with greens/tomato in mixed salads. Carrot juice is a refreshing drink, enjoyed either alone or with fruit/vegetable juice. Carrots complement well with vegetables like green beans, potato, peas in variety of recipes either stewed, in curry, stir fries, etc. In South Asia, delicious sweet dish, "gaajar ka halwa," is prepared using grated carrot, almonds, cashews,pistachio, butter, sugar, and milk. The root is also used in the preparation of cakes, tart, pudding, soups, borscht, etc. They are also employed in the preparation of healthy baby foods.